Speakers at a programme on Wednesday called for greater youth participation in Bangladesh’s local governance for attaining Sustainable Development Goals (SDGs). The two-day event on “Local Governance Issues” began at the National Institute of Local Governance office. It was organised by the Efficient and Accountable Local Governance (EALG) project of the United National Development Programme (UNDP) in association with the Local Government Division of the Ministry of Local Government, Rural Development and Cooperatives. The workshop brought together 52 young , from different public universities who received Tk 160,000 research grants in groups or as individuals. 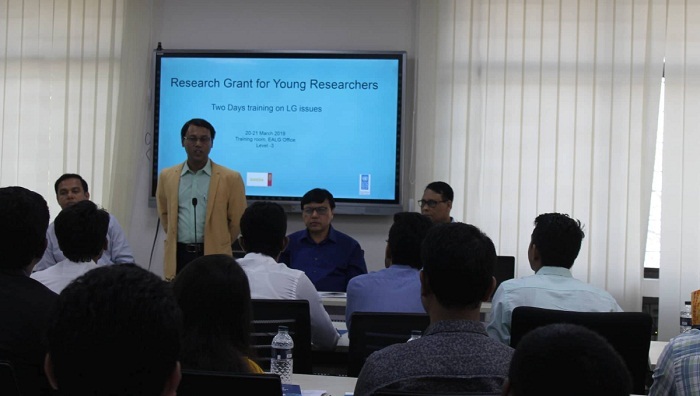 The grants are provided by the EALG project of UNDP, in partnership with the Institute of Bangladesh Studies (IBS) - University of Rajshahi, Centre for Governance Studies (CGS), Jahangirnagar University, Bangladesh Academy for Rural Development (BARD), and National Institute of Local Government (NILG). They are expected to enhance understanding on local governance issues of the researchers and improve their skills, said a press release. He urged the youth to work for achieving the Sustainable Development Goals, leaving no one behind. Among others, Md. Zahirul Islam, Deputy National Project Director of EALG project, Md. Mozammel Haque, Policy Specialist of UNDP Bangladesh, Abu Shahin Md. Ashaduzzaman, Project Coordinator of EALG project were also present in the training. Strengthening local governance has been a key focus of the government of Bangladesh and UNDP and as a part of its continuous interventions, UNDP, in collaboration with SDC and DANIDA, has developed the Efficient and Accountable Local Governance (EALG) Project with the aim to strengthen the capacities of local governments (UpazilaParishad and Union Parishad) to foster participatory local development in the rural areas.